When it comes to offering The Gift of Thrift, I like to collect items throughout the year and offer a present that is curated especially for its recipient. For my brother-in-law who is a country music fan and a cowboy aficionado I paired this church rummage sale book with a stoop sale harmonica. At a flea market in New Jersey, I found this 1970s pin perfect for my mom, who is also a grandmother, and pinned it to the thrift store cording that is tied around this gift. For my sister, I wrapped up a pair of 1960s wooden salt and pepper shakers I picked up at a Long Island thrift shop and offered it along with a recipe box of the same era. To complete the collection, I added a set of Current recipe cards from the 1970s that I found at a flea market. What to do with a roll of vintage shelf paper I bought at a garage sale for a nickle? Why turn it into colorful gift wrap, of course! How could I pass up this $3 box of goodies at an estate sale in Kansas City? It's jam packed with goodies from the 1960s and '70s -- colorful ribbons, a dozen promotional pencils, mini stickers and a white poinsettia. Now I call that a box of fun! 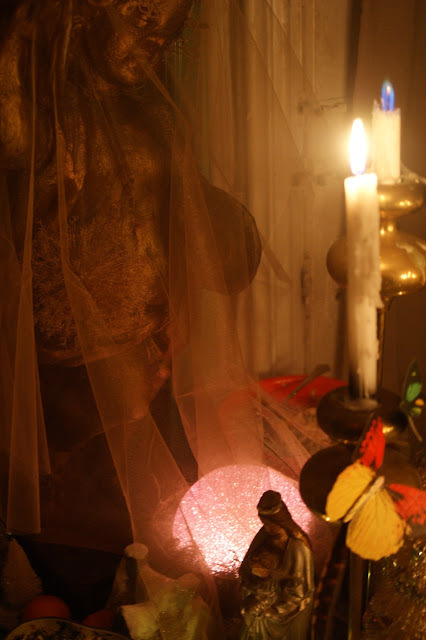 Remember when I showed you photographs of Michael Quinn's Christ-mystical gathering last week? 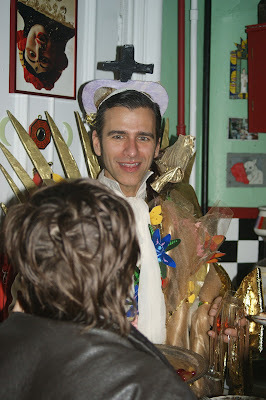 Well here is another of his fabulous fiestas that he put on a couple of years ago. 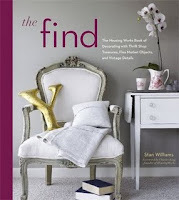 You may also recall Michael's talent from The Find: The Housing Works Book of Decorating With Thrift Shop Treasures, Flea Market Objects and Vintage Details, who along with Heather Kerr and their crafty pals, stood out as shining examples of how to create a successful party on a budget. Here's the exterior of the invitation, all folded up like a plastic wallet. Note the working button and the zig-zag stitching around the edges. And then the glorious interior -- handcrafted with multiple layers and textures -- touting a Christmas-Mexican get together and requesting a white elephant gift that started with an "M" and ended in an "O." Veli and I took a mango and a container of Milano cookies! Here are some amazing scenes from the evening's Christmas festivities, which could easily translate into any party-worthy occasion. Isn't she pretty as a poinsettia? 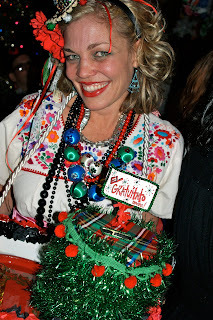 Heather's all holidayed out, serving shots of tequila from her decorated tray. Note the tip jar! The decor took traditional reds and greens and mixed in a Mexican twist. so they could accompany Michael and Heather playing carols on a vintage organ. Festive food was plentiful! 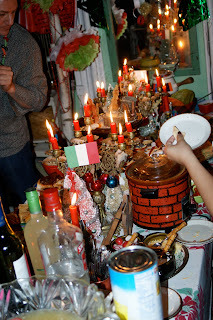 I was especially attracted to spicy chili bubbling in a bricked-over Crock Pot and the mass of red candles clustered in vintage candelabra. 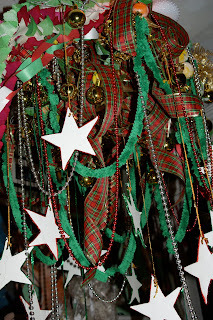 Don't you remember making festive paper chains like these when you were a kid? These got a South-of-the-Border embellishment of metallic paper cutouts with a flower ball featuring Freida Kahlo's portrait. And this cheerful holiday piñata star hanging from the ceiling packs a blast of holiday heat! The Gift of Thrift: It's a Wrap! For me, the most fun I have giving a gift is trying to find memorial ways to package my offerings. That's why throughout the year, no matter where I may have traveled, I always keep my eyes open for ribbons and trims with which I can personalize my presents. Here is a bunch of ribbons I bought at a garage sale in Independence, Missouri. I think I paid less than $5 for all of them. I am also always on the lookout for gorgeous, decorative tins to contain my gifted sweets. I think I paid $1 for this at Goodwill. Sometimes you come upon a container that's so special that it almost becomes the gift itself. Take this antique, wooden log cabin found in a vintage shop, for example. All I did was place the gift inside, wrap it up with one of my thrifted bows, and it became a standout under the Christmas tree. During the holidays, I'm always invited to all kinds of parties. As you may know, I love to offer a friendly pineapple upside-down plate on arrival, so I always seek out an original platter that fits the recipients personality and offer it along with the baked treat. That way they can keep the serving dish and I never have to worry about retrieving it! And then there's the sparkly, vintage handbag -- perfect for tarting up, dropping in a gift certificate along with other goodies and closing it with a colorful ladies scarf. Hope your holidays are filled with many memorable moments shared with family and friends! Last summer while hitting the garage sales in my hometown of Independence, Missouri, I found two boxes of unused 1970s Christmas Cards for one dollar! I refreshed these old cards with ribbons, glitter and bells (which, by the way, I hear have cost some recipients some coin to retrieve....sorry!) and sent them on their merry way to all of my nearest and dearest. Every year I eagerly await a Christmas party invitation from Michael Quinn, my beyond-creative buddy who lives in Carroll Gardens, Brooklyn. This year's notice was not to be outdone, announcing a magical, Christ-mystical theme for the annual gathering. As you can see by his get-up for his gathering, Michael celebrated all holiday traditions of multiple religions and earthly pleasures. The table was moodily set with veiled cherubs, nativity scene figurines and paper butterflies that Michael rescued from a Tiffany & Co. window display. 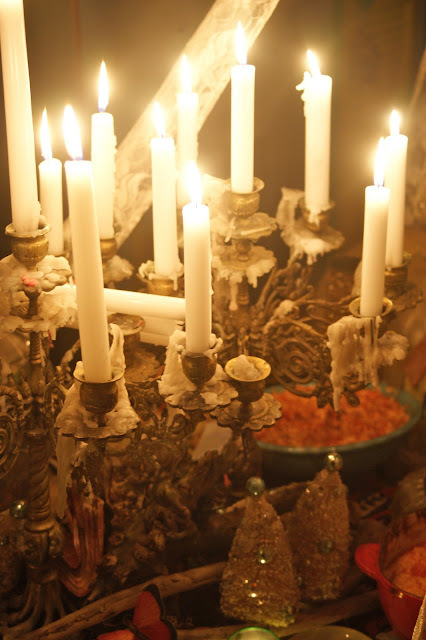 A Victorian candelabra filled with glowing white candles found its place among vintage ornaments that graced the scenario. 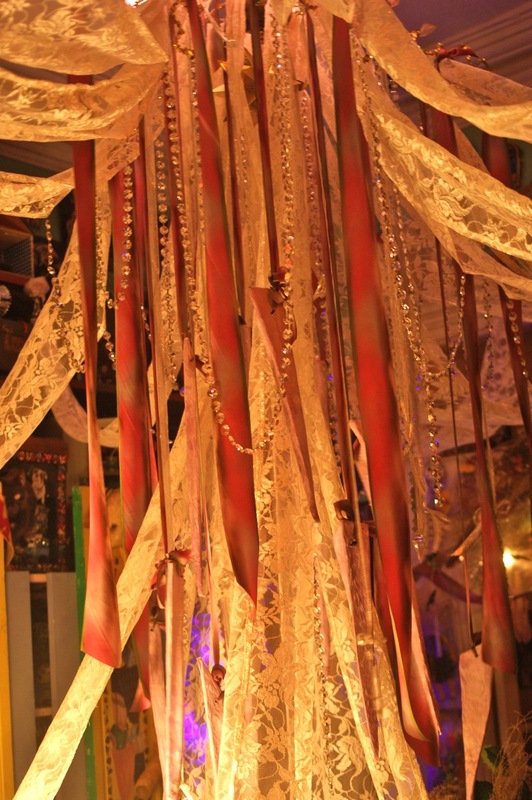 Streamers, beads and lengths of white lace draped from the ceiling, accenting the tablescape below. The living room ceiling was strewn with even more lace, holding colorful holiday orbs in front of a lit, papier-mâché globe. As always, it was yet another Michael Quinn production worth tooting a horn about! 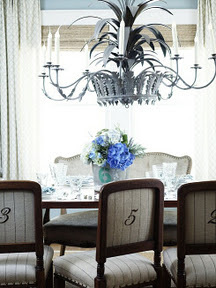 When creating a theme for a tabletop, often the decor will hint as to the direction one may take. Such was the case when we photographed the home of Coastal Living's Heather Chadduck for the pages of The Find: The Housing Works Book of Decorating with Thrift Shop Treasures, Flea Market Objects, and Vintage Details. 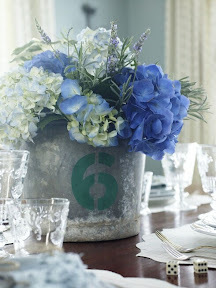 Chadduck, who had already embellished her flea market chairs with stitched numerals, completed her counting scenario by placing florals in a thrifted metal bucket stenciled with the number six. 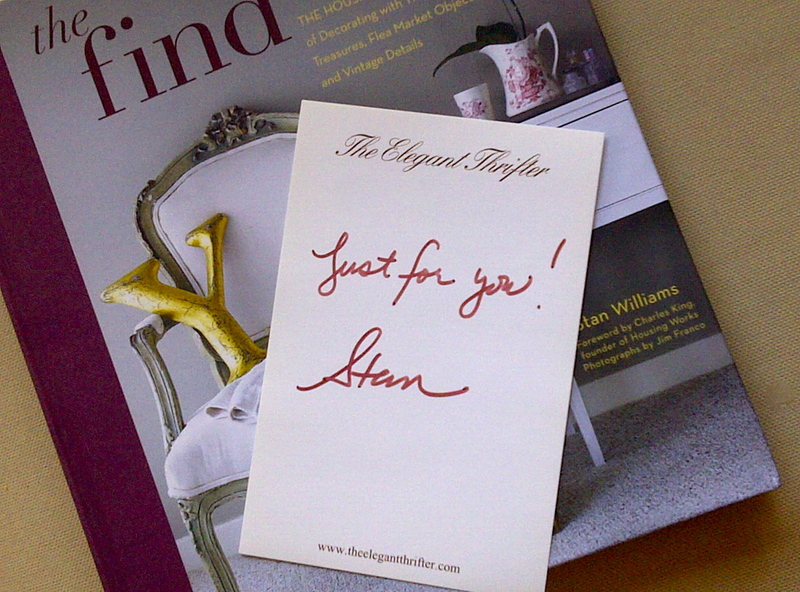 If you have a copy of The Find: The Housing Works Book of Decorating With Thrift Shop Treasures, Flea Market Objects, and Vintage Details, drop me a note at theelegantthrifter@gmail.com, and I'll send you a personalized bookplate. Give it as a gift, or treat yourself, from retailers like Amazon and Barnes & Noble. The best Gifts of Thrift are ones that speak to the passions of the recipient. Such was the case when I received a book from a friend who noticed how much I admired the same book in his home library. 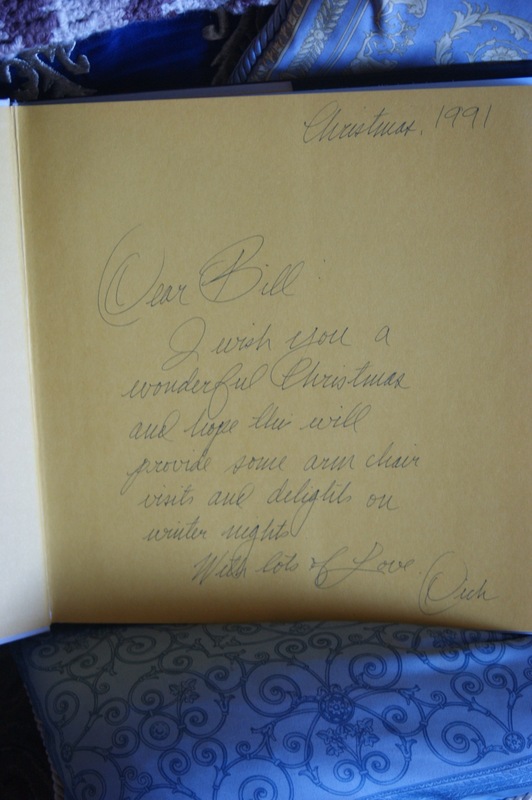 He found this copy of The Splendor of France on eBay, and it appears to have been a heartfelt Christmas gift to a certain Bill 20 years ago. One man's Christmas gift becomes another's birthday present!